There are a number of technology solutions designed to help companies accelerate improvement initiatives and support business process improvement disciplines such as Lean and Six Sigma. It isn’t surprising that software buyers can become confused or overwhelmed by all of the choices. 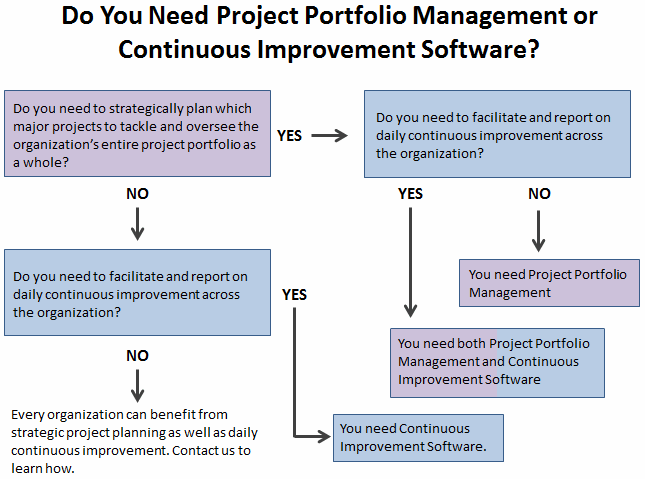 When it comes to project portfolio management (PPM) and continuous improvement software, we find that often buyers are unsure about whether and how they differ. People often wonder if they must choose one or the other - or if both can work together. Let’s have a closer look. PPM software is designed to support the process of selecting large-scale projects and managing the organization’s entire portfolio of projects as a whole. It is used to help project managers to analyze and manage large scale projects. It also provides visibility that enables leaders to evaluate and prioritize projects and control related investments. Decisions to add or subtract projects from the portfolio are based on the value of the entire field of projects. The goal is to arrive at the best mix and order of projects to meet the company’s financial and operational goals. Project portfolio management software emphasizes the process of selecting which projects to undertake and how to fund them, rather than on how to actually run the projects. It’s used by people who are project management experts, rather than by the average employee. PPM software provides the information that experts need to analyze and manage the details of every project in the organization. Because it's targeted to experts, people need lots of training to get started, and develop proficiency only after long term use. How Does KaiNexus' Continuous Improvement Software Differ? KaiNexus is designed to empower all employees to participate in the improvement process. This includes bottom-up, daily continuous improvements such as A3s, huddle boards, and suggestion systems, as well as large-scale, top-down improvement efforts (i.e. Kaizen events, VSM events, Lean projects, etc). It helps organizations to capture opportunities for improvement from everyone, and then to manage assignments, define tasks, ensure timely progress, measure the impact, and spread the impact of all improvement work. PPM and KaiNexus each play a different role in an organization’s efforts to make good investment decisions and embrace positive change. They address different needs and are in no way mutually exclusive. Since many companies believe that it is just as important to support strategic project planning as it is to make sure those projects are executed efficiently with measurable ROI, they deploy both types of solutions. While project portfolio management and KaiNexus are in the same ballpark, they play very different positions. The best practice is to let each of them contribute to your success with what they do best. Learn more about continuous improvement software in this free eBook!